If you have been following KRD on Facebook or Instagram you have likely seen this Master Bedroom before. This is my Master Bedroom and is one of the places in my home that I feel is most expressive of my personal style, partially because it is one of the areas that is the most complete. We have three children under the age of 4 that have the run of house, so my husband and I chose to focus some energy on our Master bedroom first, something just for us. There is actually still so much more I want to do in this space. For instance, I would love to add some softness and texture with some curtain panels on the short windows and a little seating under the picture window. More on that when I get to it! It was important for me and my husband that our bedroom didn't feel too masculine, or too feminine (as is often the case) I think we have found a nice balance here. 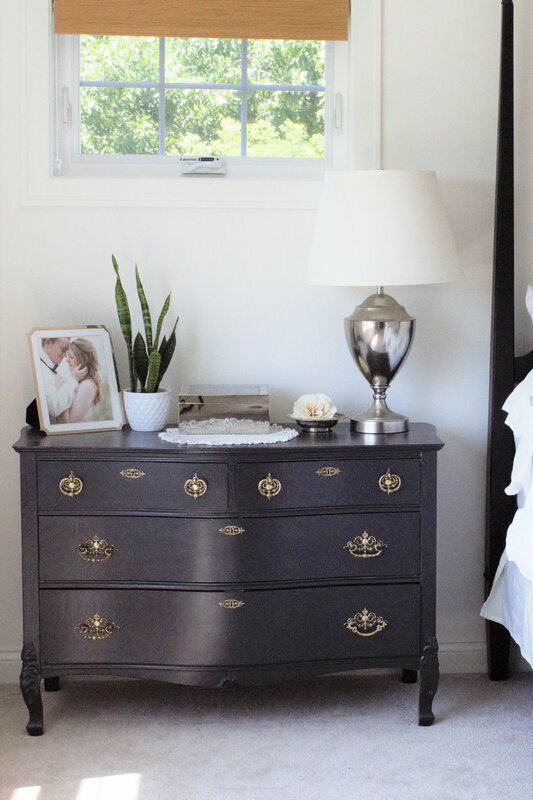 To achieve this balance I did things like bring together light and dark tones, hard and soft lines, etc.The black finish on the bed and dressers add weight to the otherwise light and airy space. 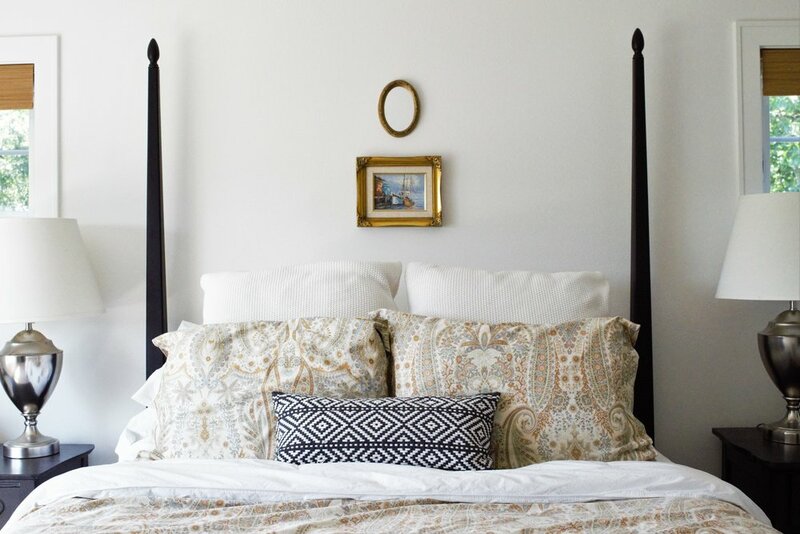 The straight posts on the bed bring structure and the softer lines on the dressers give the space some ease. With all these opposing elements I brought cohesion by using a matching finish. The bed was purchased new from Ethan Allen, but the dressers are both second hand finds that my husband and I refinished to match. I have been asked about my decision to put small scale wall decor above our bed. Yes, this was intentional. One reason is that I wanted to keep the space simple, uncluttered. I also feel like leaving some breathing room above the headboard allows the bed posts to play a larger roll in the design. The painting and mirror were both found antiquing in Door County. Some greenery adds life and natural color to the space. Live plants have been proven to have health benefits. I recommend keeping some easy to care for house plants around. They look good and they are good for you. I also keep a wedding photo and the silk flower I wore in my hair that day on my dresser. Oh, and that doily you see there, one of many my grandmother made. As long as I knew her she always had a crochet hook in hand and it is such a gift to have these items she crafted with us to bring back happy memories of her.